To make it easier to operate we have replaced the removable batteries with non-removable batteries. Replaced the (sometimes confusing) rubber push button on the bottom of the unit with an ON/OFF switch. To make it easier to carry we have included a heavy duty nylon holster with belt loop. Increased the strength of the stun. To offset the cost of these improvements we have removed car charger and kept the price the same. Military Grade Aluminum Alloy Baton: The shock proof exterior allows it not only to be used as a self-defense tool for striking an assailant but it can withstand rugged use and extreme conditions often encountered by the military and law enforcement officers. Powerful Stun Baton: Combining the power of this 9 million stun baton with our Triple Stun Technology (TST), the bright and loud electrical burst illuminates the entire top of the stun baton and will quickly take down anyone unfortunate enough to come in contact with it. Blinding 3 Watt CREE LED with 5 Light Modes: It will not only safety illuminate the entire area at night but can also be used to protect you. When shinned in the eyes of an attacker, the ultra-bright 140 lumen light can have a temporary blinding effect making it easy for you to immobilize them with the stun gun or strike with the baton. (Note: 140 are the actual lumens. Some companies will exaggerate this number and claim a light this bright to be 280 lumens or more). Disorient the Attacker: Shining the ultra-bright light directly into someone's eyes will cause disorientation and impaired vision. The Police Force 9,000,000* Metal Tactical Stun Baton Flashlight boasts a bright light beam with Self Defense Strobe that can disorient your attacker and give you time to flee. Strike or Stun! If these aren't enough to deter your attacker, a blow from the metal baton or a shock from the powerful stun gun certainly will. Police Strength Protection: Engineered to meet the demands of Police, Military, and Security Professionals worldwide but also available to civilians. Triple Stun Technology: Most stun guns on the market today have only one or two points of contact. When using this model to defend yourself, the Triple Stun Technology (TST) allows an electrical charge to emanate between three separate points on the top of the stun baton (two sides and the middle). This creates a larger stun radius, allowing you to easily defend yourself. Even when test fired the loud, bright electrical burst is often enough to stop an attacker, and if not, a jolt from this unit certainly will! Tactical Striking Edge: Increases effectiveness as a self-defense tool and as an emergency glass breaker. No Slip Grip: The diamond pattern on the rubberized handle ensures a firm grip. Blinding 3 Watt Cree LED Light: Not only will the flashlight safely illuminate the entire area at night, but it can also help to protect you. When shined in the eyes of an attacker, the ultra-bright light can have a temporary blinding effect making it easy for you to immobilize them with the stun gun or strike with the baton. Long Life Bulb: The LED Bulb will last up to 100,000 hours. 5 Light Modes: There are three light strengths (maximum, medium, and low) and two light patterns. When the situation does not require maximum light strength the other two settings can be used to conserve battery strength. The strobe light mode can momentarily blind an attacker and the SOS rescue light pattern can signal for help in an emergency. Long Reach: At almost 17 inches long, this tactical baton is long enough to keep you a safe distance away from your attacker but short enough to carry on your belt using the metal clip. Safety Features: To prevent accidental discharge, three levels of safety have been built in. The on/off switch on bottom must be set to on, the function selector button must be in stun mode, and the stun activation button must be pressed before the stun will operate. Easy to Carry: To make it easy to carry, a metal ring with clip is included. 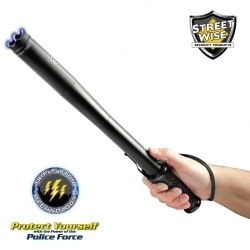 Lifetime Warranty: The Streetwise Police Force 9,000,000 is manufactured using the highest quality components by Streetwise Security Products, the leading stun gun manufacturer, and backed by a lifetime warranty. NOTICE: DUE TO STATE LAWS, WE CANNOT SHIP THIS ITEM TO ADDRESSES IN THE STATES OF HI, IL, MA, MI, NJ, NY, RI, OR TO THE CITIES OF BALTIMORE, MD OR PHILADELPHIA, PA. IT IS POSSIBLE THERE MAY BE OTHER AREAS THAT RESTRICT THIS ITEM THAT WE ARE NOT AWARE OF. THEREFORE, THE RESPONSIBILITY FOR DETERMINING THE ULTIMATE LEGALITY OF THIS ITEM IN ANY PARTICULAR LOCALE RESTS WITH THE BUYER. IF YOU ARE NOT SURE IF THIS ITEM IS LEGAL TO OWN IN YOUR AREA, CHECK YOUR LOCAL LAWS BEFORE ORDERING.